Stolen Movie Blu-ray Review It's a little bit cheesy but it's still a fun yet ultimately forgettable. Being a Nicholas Cage aficionados, this movie really slipped through my radar and given the genre of this film, it's actually not a bad movie perse. 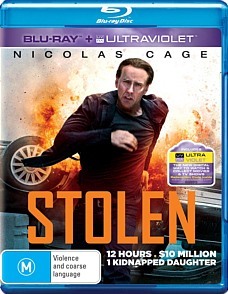 The story revolves around Will Montgomery (Cage), a professional thief who has spent the last 8 years in jail due to a double cross with the missing 10 million dollars still not unaccounted for. When he is released, he decides to turn over a new leaf and tries to claim back what he lost during those 8 years. More particularly, his relationship with his daughter Alison (Sami Gayle) but things are never this black and white in this action crime story. Unfortunately for Cage, the FBI agent who imprisoned cage Tim Harlend (Danny Huston) and former partner Vincent (Josh Lucas) believe that Montgomery has ferreted the money away somewhere. With 10 million dollars still unaccounted for, Vincent will stop at nothing to get this money. As a result, Vincent kidnaps Montgomery's daughter and gives him the ultimatum of returning the money in order for his daughters freedom. However as the deadline counts down, Montgomery is forced to become a thief again as he teams up with his former partner in the crime, the gorgeous Riley (Malin Akerman) as they plan the ultimate heist together. Clichéd? Yes! Classic Nicholas Cage Acting? Yes! At times, Stolen reminds me of Con Air with its subtle parallels and ironically the director of this film is Simon West who is also responsible for the aforementioned film. Even though the script is at times sometimes embarrassingly bad, Cage manages to save the film with his co-actors which successfully manages to keep the tension quite high. Given that, the film is a little long due to the sometimes unbelievable plot and some elements like the forced love interest but the classic one liners of Cage and Lucas more than make up for the cheese factor. It's basically classic Cage with classic 90's story telling. Video and audio quality is quite impressive with vibrant colours, sharp images and clear audio with perfect levels. 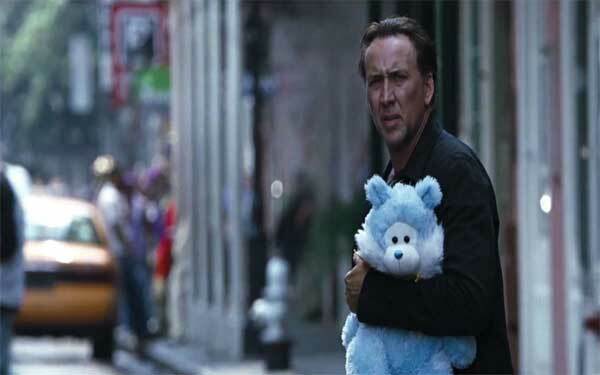 Stolen may not be the most memorably Cage film but it gives the viewer a fun rollercoaster experience from start to finish with that oh so memorable Nicholas Cage touch. It's a little bit cheesy but it's still a fun yet ultimately forgettable.